The aroma is red wine vinegar. The taste is... more like a lambic or gueuze than I expected. Sour. Crisp. Not at all metallic like I remember. Better. Surprisingly refreshing. 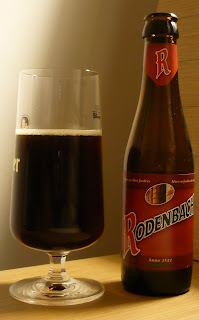 It’s not the right beer for a cold night like this, perhaps, but I can imagine drinking a couple of these on a warm summer’s evening on the terrace. blech. stop deluding yourself. that stuff is miserable.